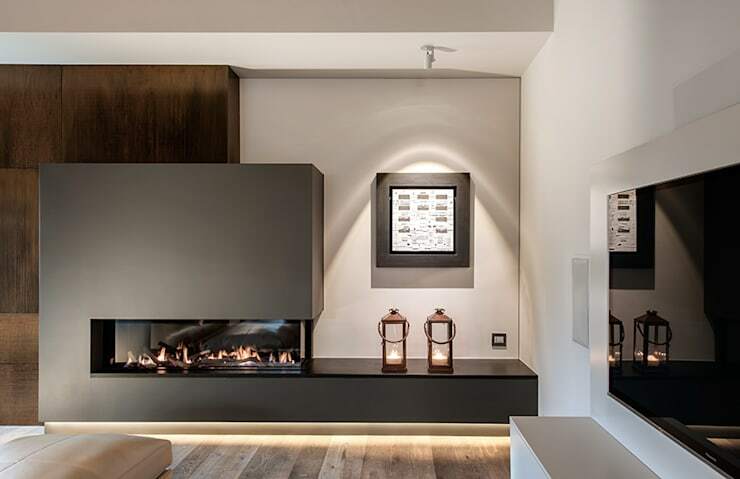 We've talked a lot here on homify in recent weeks about just how important it is to have a really well functioning, aesthetically pleasant and harmonious living room, with particular regard to how to truly make your living room an individual one. It's worth remembering that the central purpose of a living room is embedded in the name itself: of all the rooms in the house, it's in this room that we really live, and ought to live very well. After all, relaxing, socialising, rejuvenating: that's what life's about isn't it? It sure is when we're at home, so we ought to make our living spaces as conducive to comfort as possible. Today on homify, we're going a step further with our living spaces by taking a look at how to create a truly cosy living room. With a few wise tips, nous and know-how, you'll be able to transform any living room area from something basic and simple, into something that induces instant cosiness each and every time you set foot inside it. Read on to find out how. Lighting: there is no room in the house that doesn't benefit from a wise and clever choice of lighting, and the living room is most definitely one of the rooms that stands to benefit the most. Ultimately, whatever the state of your living room's pre-existing furniture and hardware, installing a fantastic array of new lighting—from the bulbs to the shades—can turn almost any living area into something truly cosy and special. Of course, it always helps to have a head start with a well-designed, and beautifully modern open plan living room like the one in this great example. 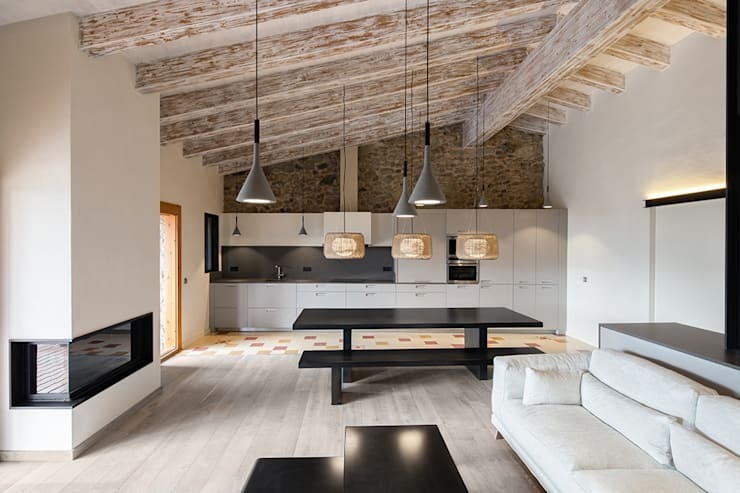 Here, chic furniture meets a sleek pitched roof with exposed timber trusses and an all-wooden interior inlay, but it's the lighting that really strikes a cosy note. The choice of conical triangular hanging lamps over the middle table and sitting area brings an instant sense of warmth. All in all, the mood-inducing lamps shed delightful light to turn a smart looking interior into one that looks and feels warm and hospitable. Choose great lighting, and enjoy a similar effect. We here at homify understand just demanding a living room overhaul, or even a basic remodelling, can be. Feel like you need a little extra guidance? Why not gain some wise advice on how to get started from a professional? 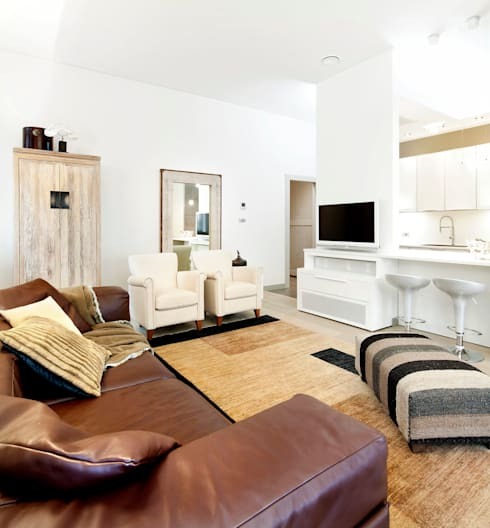 As well as having the right lighting and other accessories set up in your living room space, it's important to re-consider the very basics of what constitutes a living space to begin with. When we relax in the living room, the majority of the time we'll be sitting or laying down, so we really need to factor how and where we'd like to do that. Cosiness here comes down to sheer comfort; we ought to fit out our living spaces with chairs, lounges and couches that not only look great and fit the style of the room, but make us want to sink into them for hours on end. 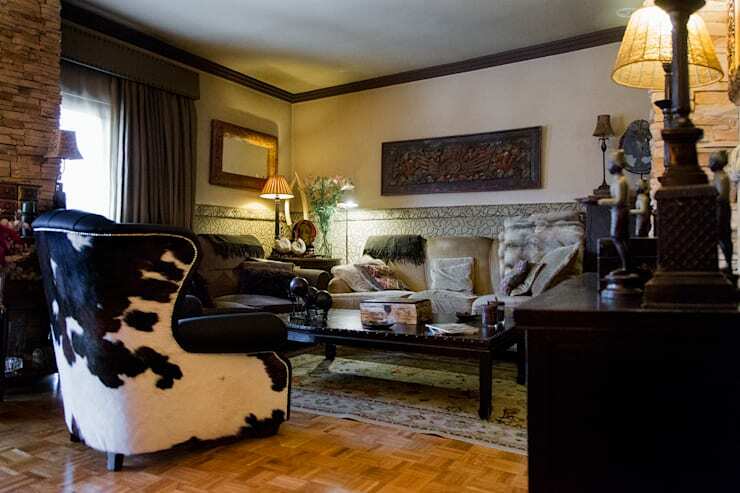 In this great example, we see how even in a modest space, chairs and couches make all the difference. Here, a neat cow print lounge chair faces off with two other leather and upholstered couches, altogether basking in the corner lamp spill to create a truly relaxing, effortlessly cosy living room. Moving on from lighting, we arrive to the light and warmth of a more primitive kind, forebear to today's modern electrical effects. Nothing says 'cosy' in a living room like the installation of a feature wood burner or open fireplace, particularly in the winter months, when a living room's cosiness level ought to be at it's zenith. The truth here, folks, is that a wise choice of wood burner can make all the difference between comfortable and cosy. So many of us these days choose to live in larger, open plan spaces that sport a great deal of wall space, high ceilings and a bright, airy, and open configuration. With such reverberant and breezy spaces, it can rather difficult to create a space that not only looks artful, contemporary and chic but also one that give off a sense of warmth and cosiness too. It's all well and good to have an impressive living space, but if it doesn't lull you into wanting to spend time there, what use is it? In this fine example, we see how a large, modern and open plan living space is afforded an instant burst of cosiness with the inclusion of a simple feature rug. Especially in spaces with floorboards, whether cow print or conventional, a luxurious rug can really make all the difference to the level of cosiness achieved. We can't stress enough how important it is to accessorise your living room space in order to induce an adequate level of cosiness for you and your family to enjoy each and every day. From cushions, to wall units, to mirrors, to ottomans, introducing a fine selection of appropriate and artistically selected accessories can make all the difference to a truly cosy living room space. 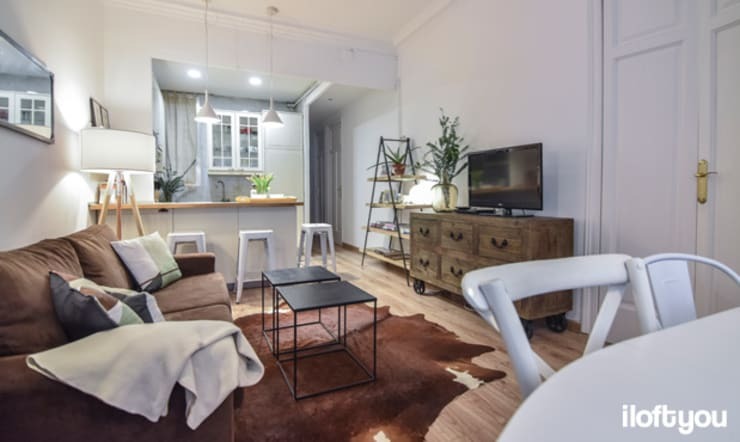 Here, we see all those ingredients on show, and more: a tidy and thoughtful entertainment unit, a neat selection of complementary lounge chairs, couch and footrest, as well as a floor to mid-ceiling mirror by the doorway, and a vintage rustic storage unit too. Accessorise well, and you're well on your way to living room cosiness. 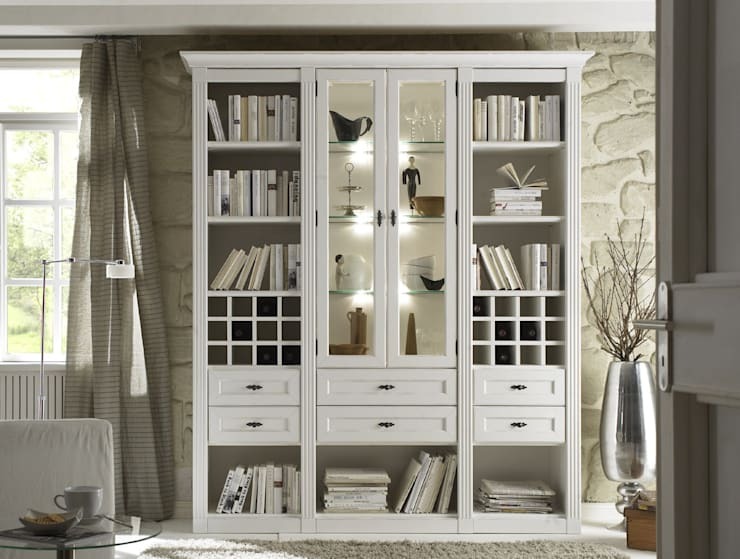 Bookcases: is there anything they can't do? Worlds within worlds, books create instant warmth in a room when bundled together and housed in a beautiful bookcase unit. Consider corralling your paperback titles and set them up for show in a well chosen bookcase like this white wooden wonder. Stand back, and let the cosiness ensue! Did you like this Ideabook? Why not brush up on some more fantastic living room advice with Unique living room furniture? Do you have any other tips on how to create a cosy living room? We’d love to hear from you in the comments section below!